I purchased this unique fabric locally. 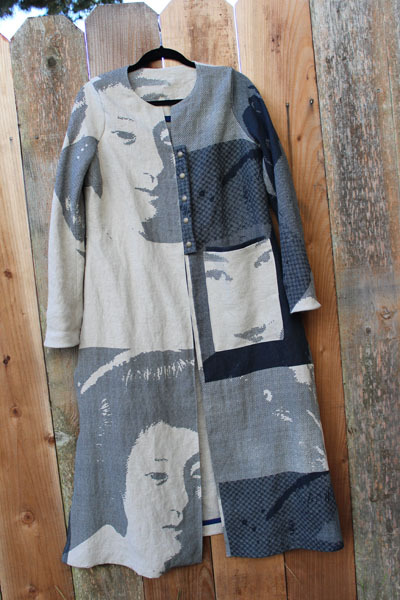 This two-toned (natural and marine blue) 100% linen features giant pointillist Geisha faces. It is woven using a coarse linen thread so the fabric is fairly heavy but has a nice drape - the texture reminds me a bit of burlap, but in linen. Large front and back pieces, uninterrupted by seams, to showcase the large scale print. The pattern says that the duster is "very loose fitting", but it is actually fairly fitted through the upper torso. There are two fish eye darts in the back, which I omitted. There is a small bust dart, and the side seams nip in above the waist. The duster is very loose fitting through the waist and hips. The sleeves are two-piece sleeves, cut on the bias. The front placket is also cut on the bias. The optional patch pocket is actually two pockets each: the larger pocket sits on top and a bit lower than the smaller pocket, which peeps out. The duster has an a-line shape. There are side slits, which I raised by about 3". I decided to use a size C, given my upper bust measurement. According to the pattern tissue, a size C is 41.5" (finished) at the bust. 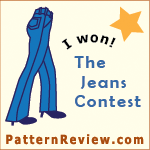 I measured the pattern tissue and this number didn't seem to be correct. I did a 1" FBA (adding 2" in width), and also cut out the side seams at a size D, but all the other seams and hems, I cut out as a size C.
The duster is unlined, but it has large facings. The facings extend to the armhole. Because of the FBA, the shape of the pattern near the front armhole was affected. I laid the front facing on top of the front, and transferred the new shape to the front facing. I narrowed the shoulders by 1". I pinned the 2-pc sleeve pattern and tried it on and it was fairly close fitting through the upper arm. I measured the pattern, and the number did not agree with the printed number on the pattern for the finished upper arm. I then measured the armscye of the sleeve and the armhole - the armhole was more than 2" larger. I measured both the paper pattern and the garment. This puzzled me. I was not sure if I had made a mistake somewhere, but I did widen the upper sleeve (and the armscye seam) by 1". I didn't increase it by more, because the sleeve is on the bias, and I thought that maybe this was intentional. When I went to set in the sleeve, it was difficult, because the sleeve was smaller than the opening. I found myself wishing I had increased the sleeve by another inch. If you make this duster, make sure to double check the fit of the sleeve and the width of the upper sleeve. I also could see that the sleeve was much too long. I shortened it by 1-5/8" but the finished sleeve was still too long by another inch or so, so I am wearing them folded back. This pattern calls for the front and back facings to be interfaced. It suggests that you clean finish the outer edge of the facings by sewing the interfacing to the facing, right sides together and along the outer edge, then flip the interfacing to the back side. The raw outer edge is encased. If you have used a fusible interfacing, you would then fuse it to the back side of the facing. Do any of you ever use this technique? I tried this technique many years ago (in the early-to-mid 80s, so it's been awhile) and did not like the result. I did use a lovely fusible interfacing from Fashion Sewing Supply, but I fused it in the normal manner. Since the duster is unlined, the seams do need to be neatly finished. The instructions use several techniques. One is the technique I describe above, where the raw outer edge of the facings are encased inside the facing/interfacing seam. For the side seams, the raw edges are folded under and top-stitched. Seam binding is attached to the sleeve hems and then they are top-stitched. The raw edge of the hem is turned to the inside and then machine stitched. The two seams in the sleeves are not finished. I suspect this is because it would be hard to top-stitch both seams, and, as they are on the bias, they will not ravel. The edges of the duster meet at center front. A placket with 5 snaps closes the duster. The pattern suggests that you can omit the placket (and wear it open), or replace the placket with a zipper. But something that did not make sense to me is that the placket and the placket lining, which are simple rectangles, are both cut on the bias. This strikes me as strange, since it would be very easy for it to distort with wear. I did go ahead and cut it out on the bias, but I am concerned that it will give me problems down the road. I made sure to fuse the placket with interfacing that was cut in a stable direction, and hopefully this will be sufficient. But I do not understand why the placket is cut on the bias. It seems unnecessary and potentially problematic. The patch pockets on this duster are very cute. They are simple rectangles, but the smaller rectangle is first sewn on, then a larger pocket is sewn on top, and a little below, so the smaller pocket peeps out the top of the larger pocket. I made a few changes. First, because of the nature of the print, I decided to put one set of pockets on the left side only. I wanted to fussy cut the outer pocket to feature the Geisha's face, so I enlarged both the under and upper pocket, by 2" in width and 2" in height. The pattern suggests that you fold in each bottom corner of the pocket and then fold in the two long edges of the corner, but this seems, to me, to be the way to achieve a lumpy finish. Instead, I mitered the lower corners of the pockets, which results in a much cleaner finish. The pattern also suggests that you use Steam a Seam (or equivalent) to hold the seam allowances in place and also to place the pockets on the garment, but I did not find either step to be necessary. Worn with my Trippens, which I call my "German Geisha" shoes! I really like this duster! Partly because of the fun fabric, but I also like the design. Before I cut out the fabric, I considered changing the silhouette. I almost narrowed the a-line shaping to make it more column-shaped. I know that is a good look for me, but I decided to leave it as-is, only raising the side slits to give it more ease of movement. I like that it's semi fitted through the upper torso, nipped in at the waist, and loose and flowing below. It's fun to wear and, I think, a flattering look. Oh my goodness, I was thinking the same thing that Margy said!!! Your rendition would sell SO many more patterns. What a great piece of art you have created. I am in agreement with both Margy and Rhonda - your rendition is absolutely stunning. And it certainly takes a lot of skill to showcase such fabric perfectly. Amazing! lovely! Thank you for the reminder about altering the facing when you make an FBA in the pattern. It's fabulous Sharon!! 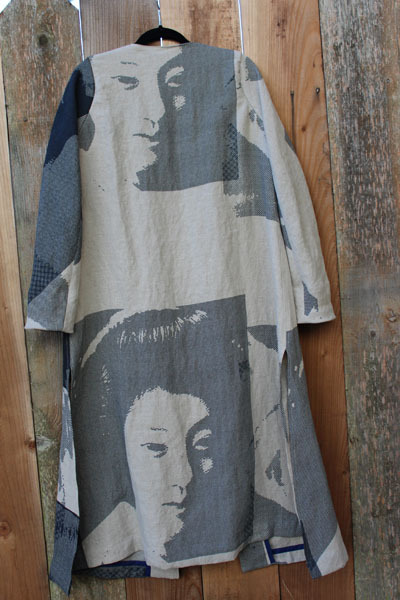 The large scale print was crying out to be used in a cool coat design like this. LOVE the Hong Kong seaming too.. so gorgeous looking from the inside view. And your shoes are just too perfect!! Stunning! The fabric is so fun, love what you did with it. I agree with Margy, yours needs to be the cover shot. Wow! this is totally amazing.THanks for sharing so many details, it is an inspiring post. Oh my goodness! Shams its fabulous. Such an interesting, unique, creative, fun and amazing coat. I have no idea how this designer fabric was used originally, but your rendition is perfect. So great! 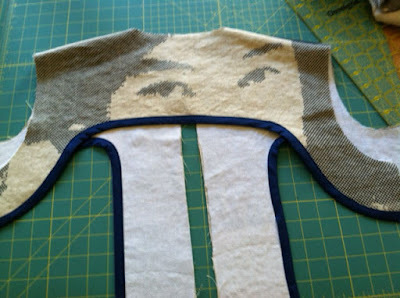 And, you know, the first thing I thought when I saw the picture of the finished garment, was "SHE looks great!" The large print doesn't overpower, and the shape and artistry of the duster fit YOU! The shoes are absolutely to die for, too! Comfortable? Or is that just too much to ask? As usual you are able to see the potential in a pattern design. This creation is truly wonderful and a great marriage of pattern and stunning fabric. Of course your attention to detail and sewing skills move it into a class of its own. Bravo and well done. Isn't it wonderful when you find a unique piece of fabric and then have it tell you what it wants to be? I love your geisha duster. In my opinion, it looks much better than the photo on the pattern envelope. Your details are exquisite. As for your query about interfacing techniques, I tried the suggested method a few times, and agree with you. It's not worth the time and effort. I prefer piping to give a clean finished look to the insides of my unlined jackets. After it's sewn in, you need to stitch along the edges to prevent them from peeking out. This is soooooo you! I love the combo of fabric and pattern and how you've made them work. I agree with the others that this is a piece of art. Great job S! Gorgeous, gorgeous! What a fabulous fabric find and the perfect pattern for the fabric. Thanks for the heads up regarding your various issues with the pattern--it's always helpful when someone who has already blazed the trail provides those little nuggets of valuable information. Absolutely love the blue you used for your interior finishwork. Beautiful job Shams! 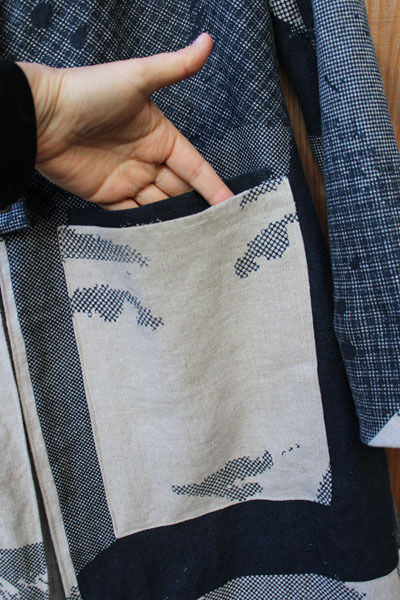 I am blown away by your talent and use of pattern with fabric! Since I struggle with FBA's, I wonder if you have a photo of the FBA you did on the pattern piece that you can share with us? I have no clue how one would add anything to this pattern top to accommodate a FBA. Thanks for inspiring me again, today. Jackie, I just did a "regular" FBA. Though I did do one tiny thing differently than I usually do. I just ignored the dart that was on the pattern. In other words, I pinned the front and back shoulder together on the pattern tissue, and put it on, while wearing a bra. I marked the location of my bust point. I just added an FBA, like I would do to any pattern. I didn't bother to move the existing dart, but I ignored it. It was a pretty small dart, or I wouldn't have done that. AMAZING! Such creative use of a wonderful fabric. Beautiful work! 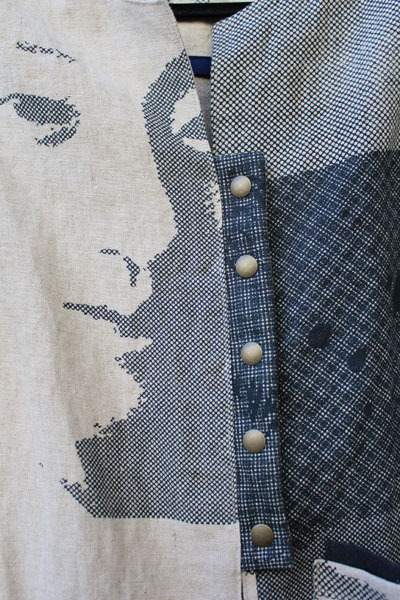 This fabric is so-o-o-o-o-o cool and so you! Love the 'duster' look and your signature 'twirl'! Know you'll be stopped on the street by women asking where you bought it. It's fabulous; a great use of fabric and pattern. You look fabulous as well. This is very flattering on you, and yes Vogue should use your version; it's so much more interesting. what a great fabric and what a fascinating analysis of the pattern and all your observations and adjustments. looks great on you and the shape is flattering and very cool. If I had to point to one garment to represent your awesome talent, skills, and creativity, it would be this duster. I agree that your version outshines the Vogue one by light years. You look sensational. Congratulations on maintaining your weight loss, too. I am struggling with keeping off the weight I recently lost, and admire your discipline. I am sorry to hear about your struggles, Moushka. I do empathize. Sometimes we just need a "reboot" button to get back on track. I do hope you can find the motivation! I understand how terrifying it can be. Gorgeous inside and out. I love the print and how you used it. In answer to your interfacing technique Q, yes, I do that. It's very fiddly to turn the interfacing over after sewing and line up the cut edges exactly. My epiphany was to cut the interfacing after sewing. 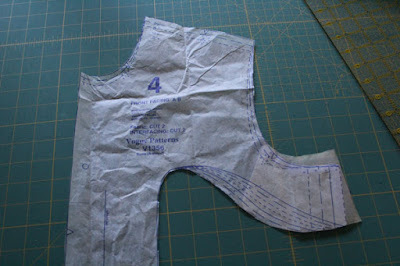 Lay your cut fashion fabric facing pieces out on the interfacing. Stitch along the outer edges. Cut apart each interfacing/facing unit. Trim the facing outer edges, notching curves. Turn the interfacing to the inside carefully, trying not to stretch it. Fuse. Trim the rest of the interfacing. Now you have fused facings with enclosed edges and interfacing that goes right up to the edge (or where you want it). Do you want me to post some photos of the process? That is so cool. Love the boots! sigh. . . sigh. . . sigh. . . . . what a fabulous garment! Brava!!! 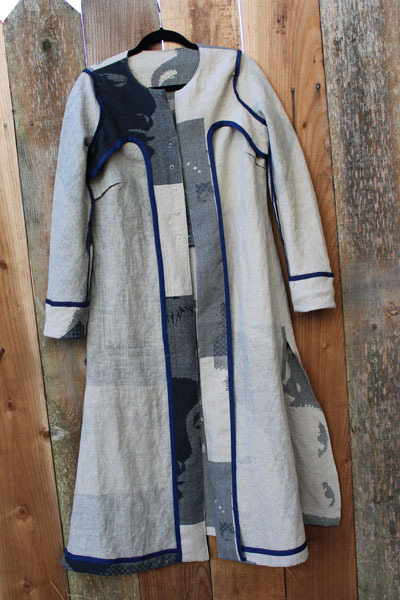 Love this unusual fabric and your sewing skill is impeccable. Is there another way to say I love, love, love this? Probably not. But I do. You look smashing. AND, the review with all the pointers is so thorough. Shams great coat! I just wanted to say that I use the clean finish method for interfaced facings where the interfacing and facing are stitched right sides together along the free edge (not caught by a seam), then turn and press. I have used this method with fusibles (fusing after turning) and non-fusibles. I really like the resulting neat, enclosed edge. Interesting, Betsy. It just seemed so fussy to me, but I haven't tried it in years. Beyond fantastic. Truly a designer original and it looks terrific on you as well. 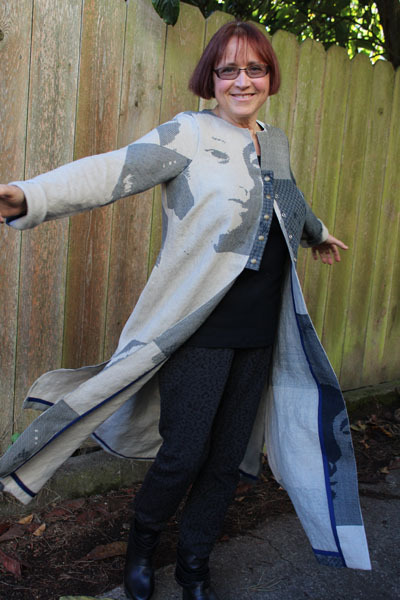 Love, love your art garment duster - such a great use of fantastic fabric! I must also add that you are one of my favorite bloggers. I check your site every day hoping for a new post. You look so runway fabulous! Distinctively beautiful jacket. A wonderful garment in fabulous fabric. It looks amazing on you Shams - I hope you get lots of opportunity to enjoy wearing it. You look amazing! You are such an inspiration. It looks fabulous! As others have said, the official photo is pretty uninspiring, but your coat is amazing! LOVE your choice of fabric. Your awesome style totally shines through on this one! Wow, that looks so good with that fabric. Perfect and perfect for your impeccable style. What a fascinating coat! That fabric must look really wild before cutting - it almost looks like different pieces sewn together and it is just beautiful! I am so curious about the sleeves and how you managed to sew them in, being smaller than the armhole - since it was cut on the bias, were you able to stretch it in the sleeve cap? The finished silhoutte is so beautiful, it would encourage me to cut all my sleeves just like that! It IS a very flattering look. The fabric was *very* interesting. It basically had 3 "columns" of images. The first column had the face upright, parallel to the selvedge. The middle column had the face sideways, perpendicular to the selvedge. I used the sideways face for the pocket. The rightmost column, was dark blue and the faces were smaller and quite dark. I definitely cut the pattern pieces out in a single layer, and very deliberately placed them. Oh, and to answer your question: I just "made it work". Not my best armscye seams, but I was able to get them to look somewhat reasonable. You are so fabulous! The coat and shoes are to die for. Love that duster -- what great fabric that is. You are looking great--very cool! Love it! 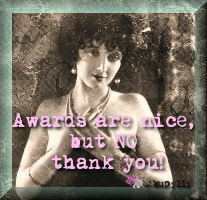 I never would have looked at that pattern until you made it-better than the pattern envelope! But as Mary and a few others said- I am too short and the duster won't work for me. Do you think it would look good cut off shorter- maybe mid thigh? With narrow pants or leggings? Might have to move or eliminate the pockets then. Trying to find a way to make it work for us short people. This coat makes you officially the coolest dressed person I know. Wow, what an amazing combination of pattern and fabric. You have a terrific eye for design and look wonderful in it. Amazing coat and definitely a gorgeous piece of art, enjoy wearing it, it looks fantastic on you! Very nice work, and I'm also talking about both the coat and you -- you look fabulous!! Wearable art - now doubt about it. It is beautifully made too. 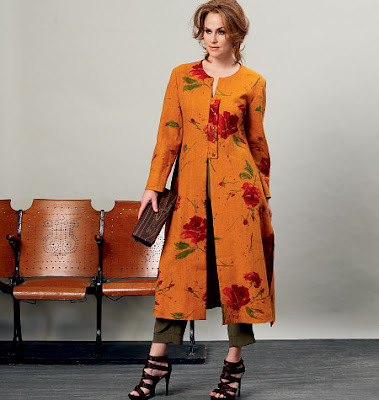 Seriously- Vogue blahed-out using that orange floral. Yours shows all of the glorious possibilities of wearable art. It's gorgeous!!! Shams, this post is a wonderful example of everything I love about your blog. You found a wonderful, unique piece of fabric and explained your thoughts about how to use it, how to fit it to a pattern, how to construct and finish it, and even how to accessorize the finished garment. Magnificent! My favorite part is the way the facings look back at you! Great job, that looks so cool! Also great observations on the pattern discrepancies. Make sure to send this post to Vogue, care of Sandra Betzina. They'll want to check out those measurements. I love your amazing duster. What great use of that fabric. I quite like the finishing facing technique you chose not to use - particularly for back neck facings in light garments, but I think your facing and finishing choice looks much better for this coat. I like reading about your thoughts and choices as you work through a pattern, it is a snippet of a sewing masterclass! I swore off Sandra Betzina patterns after several muslins taught me that the difference between her sloper and vogue's are all in the wrong alteration direction for me, but your soat is tempting me to make an exception - it looks terrific on you. This is a fantastic garment! Perfect melding of fabric with garment design! Brilliant! BTW, I've noticed that Sandra Betzina loves stripes on the bias because it makes diagonals. She uses it a lot on her garments and in her bias trim. So that may be why the closure piece is cut on the bias. I think she did it for visual interest on her original garment and the pattern maker at Vogue assumed it had to be cut on the bias. Hence an unstable piece in an area that shouldn't be. Yours puts the checks on the diagonal and it looks great. But the interfacing was smart. are you serious?!!?!! what an amazing piece!! I second all the other comments! What a great looking garment---including the inside! I'm so glad you live where such fabulous fabric was available, that you saw the potential for beauty in it while (surely) acknowledging the challenges of achieving that potential, that you had the technical abilities to create such a marvelous garment, and that you took the time and care to share your processes and techniques. What an inspiration you've shared! I haven't read the other comments, but Shams, WOW, just wow. I have NEVER seen a fabric like this one! This is one fabulous garment you have made for yourself. It suits you to a T. I think that you would win ANY contest you entered with this one. And BTW, you should send it to Sandra Betzina and Vogue Patterns. Congratulations!!! So creative and beautifully made! So courageous of you to pick apart the faces and line them up to make this all work. Anyone else would have walked away. I do not use that older method of interfacing, so fiddly, unpredictable and the result is 4 layers at the edge. I like to keep my edges as thin as possible to prevent lumps and ridges on the outside. Sandra's patterns cause you to measure and think and measure and think and alter again...don't know why that is. How devastatingly cool and, as others have commented, how totally unique. Kinda speechless, actually, but it's wonderful!! Looking at the pattern model-photo, I would have never guess something so cool could come out of it. It takes a great seamstress to look beyond that print and see the potencial. Hats off to you. A Master piece. Oh, and you are looking prettier with every new post! That is one AWESOME duster! 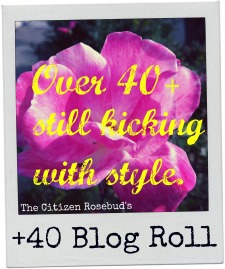 Your Duster is totally amazing! 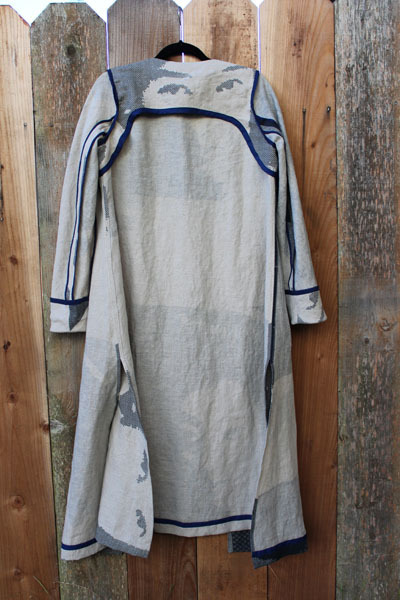 I am a little late to the party having just discovered your blog...but that duster - wow...oh wow...oh wow. I want to echo what so many others have said - it is art. Show-stopping art. Love. It.